Maribel Blas and Stephanie Lampman are excited to enroll their daughters in kindergarten in Risen Christ School’s new dual language immersion program. They say the girls will have the opportunity to become bilingual in Spanish and English. While Blas’ daughter speaks Spanish at home, immersion in Spanish and English could help her excel academically and professionally, and in the process, help her family improve in both languages. Lampman’s daughter, a native English speaker, will have the same opportunity to excel — and maybe teach her family some of the Spanish she is learning. 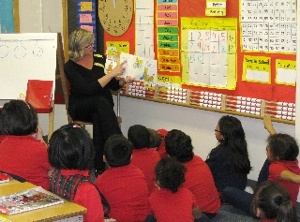 Starting this fall with the Minneapolis school’s two kindergarten classes, Risen Christ will become the first Catholic school in Minnesota to offer a dual language immersion program, in which students will receive 50 percent daily instruction in each language, according to Helen Dahlman, Risen Christ’s president. The school hopes to register about 45 kindergarteners for the program when enrollment begins next month. Changing to dual language immersion will benefit both English learners and native English speakers, Dahlman said. And it will affect the school’s curriculum, teaching staff, and in some respects, its overall identity as it seeks to better recognize the different cultures of its students. Its Catholic identity will not change, though it might find different expressions through other cultural lenses. After the school researched dual language immersion options and began participating in a national Catholic school immersion network, Risen Christ’s board voted to adopt an immersion model last fall, Dahlman said. The school will add one grade per year as each year’s kindergarteners advance; the program will be fully implemented in the K-8 school in seven years. Given its demographic diversity, Risen Christ hopes that eventually the program will consist of two-thirds native Spanish speakers and one-third native English speakers, Dahlman said. While all students would benefit, English learners — who make up more than 70 percent of Risen Christ’s 312 students — especially stand to gain from dual immersion, according to Dahlman. Ninety percent of the school’s English learners are Spanish-speaking, but some don’t have Spanish language skills that help in developing corresponding skills in English. Immersion students will have two subjects in English and two in Spanish every day. Each quarter, the language that each subject is taught in will switch. Teachers will speak to students only in their designated language. Risen Christ will purchase books and other materials for the program, but Dahlman said she doesn’t anticipate its resource expenses will increase greatly. Teachers in the program will need to be either native speakers of one of the languages or have near native fluency, she said. Several of the school’s teachers are working toward fluency, and all Risen Christ teachers receive language and cultural training. Besides looking at ways to express the Catholic faith through different traditions, Risen Christ is seeking help from pastors to celebrate a bilingual Mass, she said.